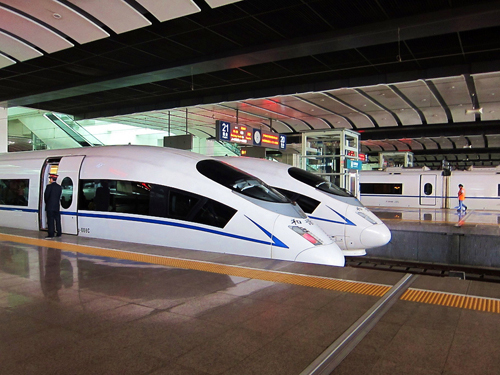 China’s ambitious high-speed rail program inaugurated perhaps its most important line yesterday: Beijing to Shanghai. The train made its debut on the eve of the 90th anniversary of the founding of China’s Communist Party with Premier Wen Jiabao onboard declaring the line ‘in operation’. 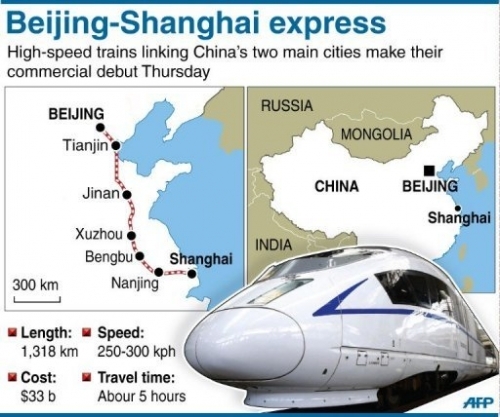 The trip linking China’s two largest cities takes just under 5 hours and scheduled trains will make stops along the way in Tianjin, Jinan and Nanjing. Linking China’s government/cultural center with its commercial/financial hub is a milestone on the path towards creating a connected nation. Airlines will certainly be hurt by the line, but because China’s air traffic is already at capacity, the train should help ease the strain on Beijing and Shanghai’s airports. Freedom of choice when it comes to transportation options is paramount to social and economic mobility. Thanks to the multitude of options Chinese citizens will be afforded when traveling around the country, overall quality of life should be improve significantly.